We're excited to Introduce "Ryan's Rankings", Big Brother 17 Power Rankings by Big Brother Superfan, Ryan (@ryanscountdowns on Twitter)! 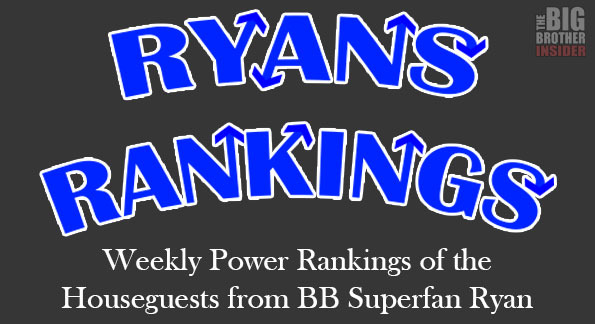 Stay tuned all summer long as Ryan will be doing a weekly power rankings of the houseguests all season, right here on TheBBInsider.com. Here is his thoughts on the houseguests before we have even seen their game-play! Check it out! Now that the season 17 houseguests have been revealed, (the first fourteen at least), it is time for the first power rankings of the season. Overall, the cast seems quite likable, but that could just be a front they are all putting on in their pre season interviews. For the first time in many seasons, the girls may actually seem more together than the guys. Could an all female alliance finally work? Still doubtful, but yes, I am saying there is a chance. While I would still be shocked if the first to be evicted is not a girl, the potential for a female winner is quite strong based on preseason interviews. The following Power Rankings are based simply on their interview with Jeff Schroeder, and their CBS.com bio’s. Since we do not know anything about their alliances, or game play yet, the power rankings will be based on an assessment from 6 different characteristics in which many successful past winners possess at least a few of the qualities. Ability to not be annoying - Lisa, Drew, Maggie, Dan, Hayden, and Derrick all won their seasons in part because they were never considered annoying by their houseguests. Ability to fly under the radar - Lisa, Jun, Drew, Adam, Jordan, Hayden, Andy and Derrick were great at flying under the radar, which paved the way to their victories. Mentally Competitive and Physically Competitive - Winning plenty of HoH’s and PoV’s helped Drew, Hayden, Rachel, Ian, and Dan win the game. So to summarize, each contestant will be given a point value of 1-14, for each of the 6 categories, based on where they will likely rank once they are in the house. The one with the most points will be the houseguests with the best power ranking on move in day. Jason is one of the legit “Superfans” on season 17. He watches the live feeds, reads Big Brother blogs, and has vast knowledge of the show. His strategy of being in an all-girl alliance, however, is likely to get him evicted early on. If the guys are in power, they will try to get him out, as they won’t trust him. And if he does manage to be the “gay glue” (!) that holds an “all-girl alliance” together, he will likely get caught making too many side-alliances, and will end up losing the trust of the girls too. He says he is “never one to shy away from conflict”, and even described himself as annoying. Two terrible attributes in the Big Brother house. “gay glue” that holds the female alliance together. In the plus column for Liz is the fact that she seems like one of the most fun houseguests. Based on their pre season interviews, if I had to choose one of the houseguests to spend a night partying in Vegas with, Liz would be my first round draft pick. Liz, however, has absolutely no shot at winning this game though. When asked about her strategy, Liz says, “I have these tight little black shorts…. that’s my strategy right there. I am ready to flirt it up.” This isn’t the Bachelor, Liz. It’s Big Brother. Liz screams first evictee to me, but if her skimpy clothes can somehow help her last til the jury, she will be the perfect goat to drag to the end and beat her in a landslide. James did not have enough time to grow his beard as long as Donny’s, but other than that, and the fact that he is younger and Asian, we have Donny 2.0 in the house. I fully expect James to be a poor man’s version of Donny though, who lists VICTORIA as one of his favorite houseguests. He seems nice enough, but I am left a bit baffled on how he was casted. He will not make any big moves, he’ll let alliances come to him, and be incredibly boring to watch. “I am a very people person” says James. Let’s just hope there are no grammar police in the house, or “very people person” James may be on the chopping block very wicked quickly. “I will not float. I will make bold moves, and I will get blood on my hands. Heads will roll.” Many houseguests have made such claims before stepping into the BB house, and most did no such thing. It seems like Audrey, however, will not let us down. I do not see her lasting very long, but no matter how many weeks she survives, she is sure to bring the drama. Her reaction to accidentally being called Aubrey by Jeff Schroeder, was over the top and unnecessary, and if she treats her fellow houseguests that way, she will be an easy early target. She is intimidating, and all business. She will play hard, and be pure entertainment in the process. Her “secret” will give her plenty of screen time in the first week, which should allow the audience to get to know her well before she walks out of the house in a few weeks after being unanimously evicted by her housemates. I am making the bold prediction of a major blow out fight between her and Jason at some point in the week 2-3 range. That is, IF they both make it to week 2 or 3. Austin will surprise the public more than any other houseguest this summer. America will fall in love with him, as they will be shocked to learn he is not a mean, frightening, wrestler; he is a kind, gentle, humorous guy that will stick up against the bullies in the house. His life motto is “Silence makes losers of us all.” Austin will be laid back, calm, and loved by the public…. until he needs to stick up for a houseguest being bullied, and then his frightening wrestling alter-ego, Judas will be unleashed, and America will fall in love with him even more. He will likely finish somewhere around 5th or 6th place, once the houseguests realize that they will not have a shot in hell at beating him in a jury vote. I was pleasantly surprised by Da’Vonne’s interview. She is entertaining, likable, and seems to be a genuine “superfan” of the show. There are two things, however, that will put a wrench into her plans of winning Big Brother. She has a seven month old daughter. Last season, Derrick was the first person to ever win the game with a child at home. If history repeats itself, which it will, week 1 of BB17 is going to be a love fest. Everyone will get along with each other, and the first HoH will be DYING to find a justifiable reason to put someone on the block. Having a seven month old daughter at home will be just the reason that the first HoH will need to throw her on the block and not get blood on their hands. If I were Da’Vonne, as difficult as it would be, I would not mention my daughter until I have reached the jury. Then rant and rave about her all you want because nobody can use “she has a daughter that she should go home to” as an excuse to give her the boot. When asked what she would like to bring into the house if allowed, Da’Vonne said “I know these people are going to push my buttons, and I’m going to need my bible to keep from exploding.” Translation: If she last more than 2 weeks, she is going to explode, bible or not. Meg is hands down, far and away my pre season favorite. Not to win the game, just my personal favorite. She is fun, bubbly, funny, a huge fan of the show, and seems to be a genuinely sweet girl. My biggest concern with Meg could be the fact that she may become a bit annoying to the other houseguests, which she openly admitted she too, was concerned about. Could she be the first houseguest evicted? Absolutely, she could easily be the next Joey. Could she be the new Victoria and be used as a pawn every week? For sure. Could she pull a Jordan and win the entire game? I sure as hell hope so. * She is a student of the game. * She seems fun to be around, extremely likable, and trustworthy. * She “loves her gay men” and if she gets too close with Jason, he may bring her down with him when he inevitably gets evicted. * She is “boy-crazy” which could lead to some seriously jealously when all the girls are fighting over Clay. This is a no brainer. If Ian terry did not win season 14, Big Brother 17 would already have its winner before the game began, Steve. But, as we all know, Ian (below) did win just 3 seasons ago. Despite Steve’s claims that he is different than Ian, he really is not. If the houseguests let Steve anywhere near the final 4, they are all the dumbest houseguest to have ever played the game. On paper, Steve should have a 0% chance of winning this game. However, there have been some VERY dumb houseguests the past 16 seasons, so I suppose anything is in the realm of possibility. Dentist John McGuire is full on crazy, and I love it. My prediction is that he will be targeted by many of his houseguests, but he will be loved by the public. He will be the Dr. Will/Judd/Zach of season 17. His diary room confessionals will be epic, he will scream and holler and be as animated as the producers need him to be, and he will make America fall in love with him. Hopefully for John’s sake, the producers can slip him some Xanax for the first few weeks, so he is not so off-the-wall, and put a huge target on himself. Hopefully for our sake that does not happen, and he is off-the-wall and puts a huge target on himself, only to miraculously survive week after week. Regardless, John will be the one houseguest that you will either love or hate. Everyone will know John, and everyone will have a strong opinion on John. First, the bad news for Clay: If he is as dull and empty-headed as his interview with Jeff portrayed him, he is going to be in trouble. The good news for Clay: If you are as good looking and athletic as Clay, you can be as dull and empty-headed as you want. More good news for Clay: If he can flirt with his houseguests as well as he flirted with Jeff, he will have all 13 of his houseguests wrapped around his handsome, assumingly perfectly-built finger. Let’s face it, the guy is a complete stud, and will be fighting off the single ladies with a stick. If he is smart, which isn’t looking good at the moment, he will stay far away from a showmance, as that will put a gigantic target on his muscular, golden bronzed back. At 33 years old, Shelli is the “old hag” of season 17. I am sure there will be plenty of references from her as to how she is the oldest in the house, and she may even be targeted because of it, which is ludacris. Not that I am not a fan of the beautiful young people, but would it kill CBS to put some legit old people on the show, like the old days. There is, however, the underlying issue of Shelli claiming to have always been in a relationship for as long as she can remember. Let’s give her the benefit of the doubt, and say since she was 17. That is around 16 years of continuous failed relationship attempts. This leads me to believe that there is more to Shelli than meets the eye, and we have not yet scratched the surface with her. As of now though, she is a favorite of mine, and if she can survive the first 2-3 weeks, she will be a major force to be reckoned with. Seriously though, if we are getting to the point in Big Brother now, where 33 year old Shelli is considered old, and it is focal point of her time in the house, I will be beyond pissed. Gina Marie… I mean, Vanessa will be in a very fragile position for the first few days in the house. Her “celebrity” status as a Professional Poker Player could absolutely spell first eviction for Vanessa, especially since one of her housemates, Da’Vonne is a poker dealer, how convenient, Big Brother. Vanessa will probably be caught in a few lies as she tries to dodge the occupation bullet, and the houseguests will be weary of her right off the bat. If she does not play the first week very carefully, she is my prediction for the first one to be evicted. Then why, Ryan, is she ranked number three in this week’s power rankings, you ask? Wonderful question, and the answer is simple. If Vanessa’s poker playing can go unnoticed, or if the houseguests find out she is a poker player, and do not care, she will go very far in the BB game. Vaneesa, can not win this game, however, if the house finds out about her professional poker playing career, because they will determine that she does not need the money, $500,000 is chump change the to amount of money that Vanessa plays poker for. Bottom line: if she can get past the first week, and keep her occupation under wraps, Vanessa is looking very good. If the cat gets out of the bag and her occupation is revealed, which it will likely be, she is toast. Becky is well put together, and has the potential to be the leader of an all-girl alliance that actually works. She will be gung ho for the alliance, and if it works, Becky will cruise to the final 2, and beat any of the other girls in the final vote. However, this is Big Brother, and female alliances simply do not work. Survivor is 39 days, which is just about as long as females can humanly be together non-stop without starting to despise each other. Big Brother is nearly 100 days. These girls will end up hating each other, and the female alliance, if it even exists, will be disbanded, and Becky will likely be the number one target. Bottom line for Becky: if she tries too hard for an all-girl alliances, she will be immediately evicted. But, if the girls are on board, she will be in the driver’s seat for the entire season, much like last season’s winner, Derrick. She reminds me a bit of Kim, from Survivor One World, who led an all girl alliance to the end, and demolished her competitors in the final vote. Becky will likely be one of the first evicted, or win the game. And right now, for some reason, I am leaning towards the latter. Without question, this game is Jace’s to lose. He is basically Hayden from last season, but will take the game much more seriously, and is much more mentally sound than Hayden. He is a physical threat, and a mental threat, but will be loved by his housemates too much for them to want to evict him. The guys will want to be his bro, and all of the girls that Clay denies will be running full speed to Jace. The one flaw I saw in Jace is that his answers seemed so overly planned out when he was talking with Jeff. He prepared his answer so well that it came across as disingenuous and staged. If he does that in the house with the other players, they will doubt him. But, I think once he gets in the house, he will relax more, and the conversations will be less planned out. Another thing he needs to watch out for, is mentioning his beach house in Venice Beach. If Da’Vonne finds out that “it was a tough decision to come on the show or not” because he didn’t want to leave his beach house for the first summer he was living there, then she will be after him with a vengeance. If he doesn’t mention his Venice Beach house, and the girls can not get it together, Jace will win season 17.